HomebrewandBeer.com forum • View topic - Please post Keg/Kegerator set-up photos please..
Re: Please post Keg/Kegerator set-up photos please.. 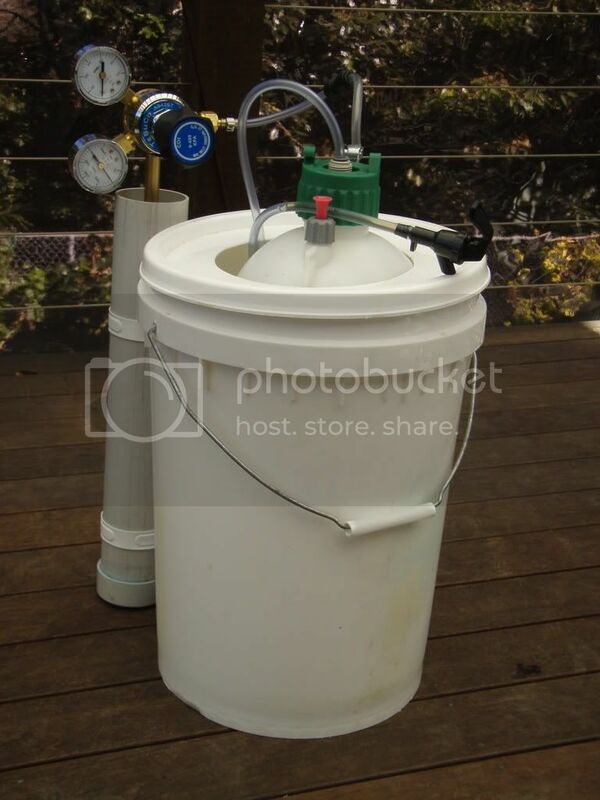 Rob C wrote: Leigh How many co2 bulbs does a whole 19ltr keg use when pouring? They say it will be about 4 but i never use more than 3, not the cheapest option but its handy. Didnt quite add enough gas to a keg i took to a party on the long weekend. After 3 pints it was dribbling out. Four 12g bulbs. Which is about $6 worth, unfortunately. Sorry Palealemale, forgot to check this thread, the VB cooler was from my older uneducated taste days now it is used to put over the tap when a keg is carbinating, it reminds me to stay away. Anyhow, some photos of my party keg which had its virgin run on a fishing trip a couple of weeks ago. Thanks to Spillsmostofit for the detailed plans of how to construct it. 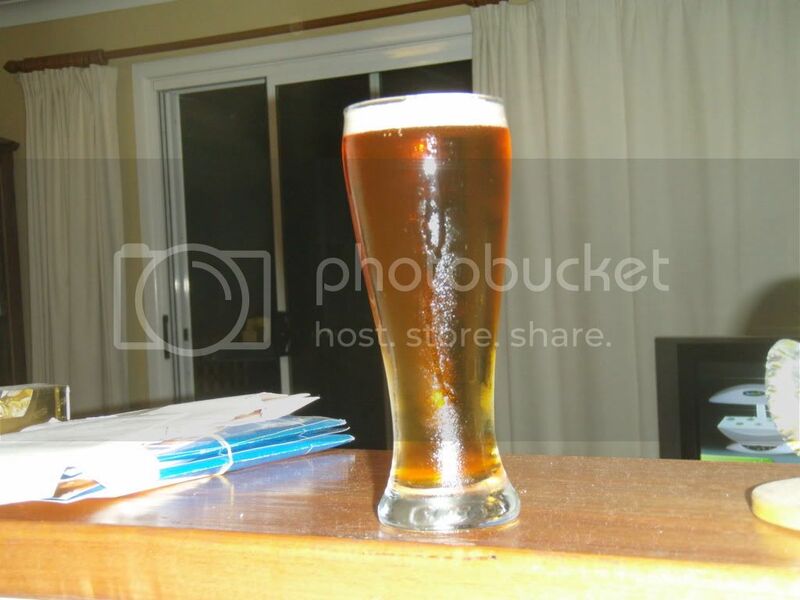 Little Creatures PA clone Partial, that was it's first brew in the poratable keg. I have converted a 120L wheelie bin into a kegerator. Insulated the inside and fit a tap to the front, keeps a keg ice cold for over 24hours with 2 bags of ice, fits the reg and a sodastream gas bottle inside. I wil lhunt down some pics. Got around to finishing off my chest freezer. Still have to add a fan and im going to add another couple of taps. Rob C wrote: Got around to finishing off my chest freezer. Still have to add a fan and im going to add another couple of taps. 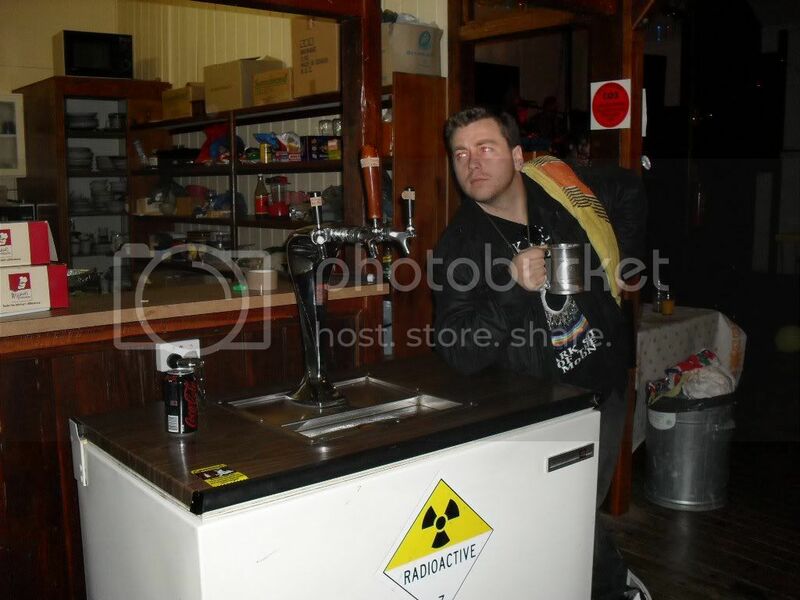 Hey Rob, what sorta freezer is that, what are the external dimensions, and how many kegs does it take? 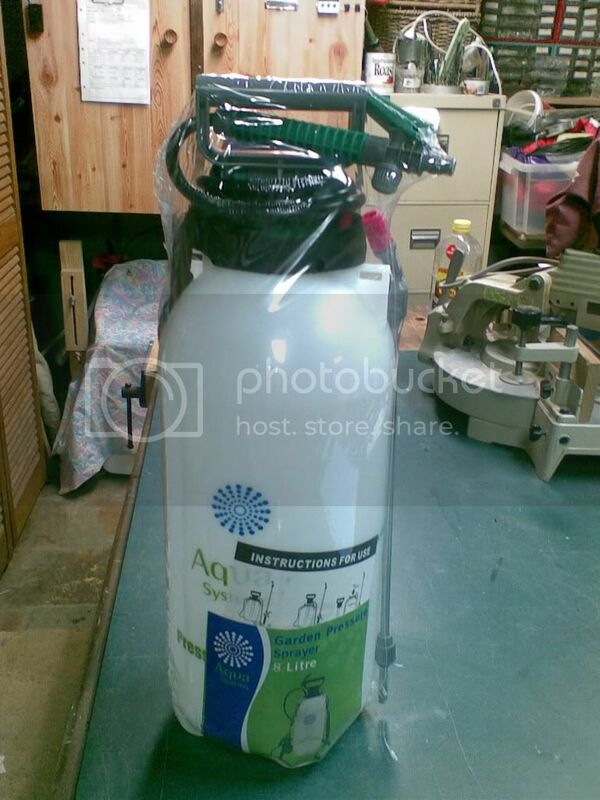 Hi Sam its a Homemaker 150ltr. Without the collar it will only fit 2 kegs. With the collar i put on it will now fit 4 kegs. Ahh, thanks Rob. I ended up purchasing a Fisher and Paykel model today, about 165 litres. It'll nicely fit four kegs with a collar. Hopefully i'll post pics in a few weeks when I get her setup. rather than spamming a new link i thought id dig an old one up and add to it here is my recently completed kegatron. proper electronic sensor and some fans keepin it power saving and super cool. keeps 6 kegs cool, runs three or 2 and a full size with different fittings. this is me hard at drink. love your forum lads. A homebrew is like a fart, only the brewer thinks it's great. First kegerator effort. Already planning the upgrade Getting the missus to pick up some taps while she's in the states. Just looking at this picture I can see I really need a drip-tray. looks good mate .. this is something i want to move into could you give an estimate on how much this set up cost you? What issues did you run into? I would allow about $500 as a minimum, but I spent more. Mainly because I got myself a good, barely used fridge and some other bits ane pieces. Its a good idea to buy the stuff over a few pay periods. Fridge - $210 (ebay) - The cost of a fridge or freezer is up to you and what quality you can tolerate. I spent quite a bit of time finding the right one for me. 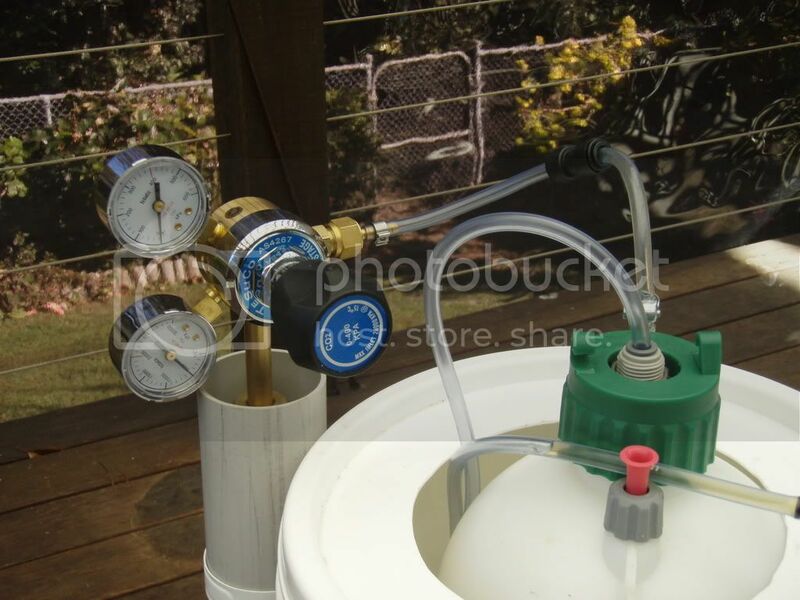 6Kg Regulator - $249 (http://www.ambernectar.com.au) Thanks Punter! Keg Lubricant - $15.90 (CraftBrewer) To preserve your keg seals. I also have a TempMate (CraftBrewer) which I bought a while ago ($74.50). If you're going to force carbonate, you're going to need to know/control your temperature. -I nearly made a complete mess of my fridge door by buying a cheap hole saw. I highly recommend getting a good one, or to save money, find a friend that already has one. -If you're going to put more that one tap in like I am. Measure out where both taps are going to go. I now have a hole-punch mark in my fridge for where the second tap will be. -Get a non-return valve. This is insurance against damaging your regulator. -Have some piping hot water ready for when you attach the gas/beer lines. The fittings are tight! -Study! I read as many websites as I could on building kegerators. Including AHB and here. -Get ready to drink too much beer. Last edited by jello on Friday Aug 05, 2011 9:50 am, edited 2 times in total. jello wrote: -Get ready to drink too much beer. Couple of Docs pics from page one win. I've had this for a long time, thinking of converiting a big old stainless lined freezer that we have at a mates place, but the mrs is afraid an old freezer will use too much power. I was going to post pics, but i can't find a button. Do you not host pics here? punkin wrote: I was going to post pics, but i can't find a button. Do you not host pics here?